This hybrid fin design takes the best aspects of a couple of old-school fin designs and combines them, along with some technological updates, into the ultimate setup for performance, wide-tailed performance boards and standup paddleboards. The lead fins closely resemble the outline of twin-keel fins and perform the same function, only in a smaller package that relies on the trailer fins (we’ll get to those next). 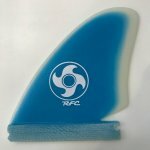 The long fin base and extreme rake of the fins ensures that the rail will hold true through powerful, arching turns; but a notch cut into the base allows for the fins to slide free when pushed by the surfer. The trailer fins are extremely upright and foiled asymmetrically — think of this like a tiny single-fin for each of your rails off of which to pivot snappy turns. The trailers are also reminiscent of the dagger-like twin fins used on the first Simmons-type boards of the late 1960s. When these two fin types are combined along each rail, the result is a ride that accelerates through turns, generates ample drive in small, gutless surf but won’t blow out when pushed to high levels of performance. This combination works so well with wide-tailed boards since the high-volume tail tends to float — or “skate” across the surface due to its buoyancy. The long base coverage and rake of the setup anchor the board down to the wave face, which results in superior drive. Still, these fins react to the will of the rider. If you want to get funky, and throw the tail out, just get the board flat and feel the magic!